[148 Pages] Impact Modifier Market is estimated at USD 2.14 Billion in 2016 and is projected to reach USD 2.73 Billion by 2021, at a CAGR of 5.0% from 2016 to 2021. The significant applications of impact modifiers are packaging, construction, automotive, consumer goods, and others. The growth in these industries will consequently drive the growth of the impact modifiers market. The competitiveness in the impact modifiers market has been intensified, with the increasing number of capacity expansions, business expansions, and collaborations. 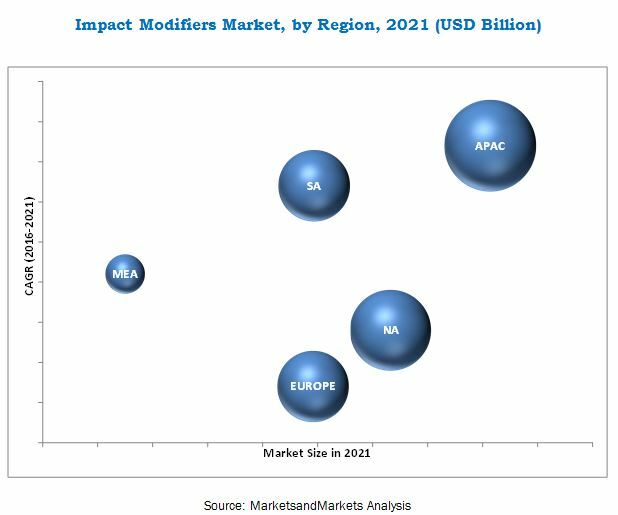 Factors such as increasing applicability of impact modifiers across varied end-use industries, technological advancements, and the growing demand of impact modifiers in the emerging regions are driving the growth of the impact modifiers market. For company profiles in the report, 2015 has been considered as the base year. Wherever the information was unavailable for the base year, the year previous to that has been considered. The overall market size values were finalized by triangulation with the supply side data, which includes product development, supply chain, and trading volume. The figure below shows the breakdown of the primaries on the basis of company, designation, and region, conducted during the research study. The ecosystem for impact modifers consists of key suppliers, including plastics as well as impact modifiers manufacturers. These are important participants in the ecosystem of impact modifiers markets as they play crucial role in the entire value chain. Various impact modifiers manufacturers such as E.I. du Pont de Nemours & Co. (U.S.), BASF SE (Germany), The Dow Chemical Company (U.S.), Evonik Industries AG (Germany), Clariant AG (Switzerland), and others have been covered in the report. The growth of the impact modifiers market is primarily triggered by the huge demand for plastic products from the packaging, construction, automotive, and consumer goods industries. The global impact modifiers market is projected to reach USD 2.73 Billion by 2021, at a CAGR of 5.0% from 2016 to 2021. The growth of the impact modifiers market is primarily triggered by the huge demand for plastic products from the packaging, construction, automotive, and consumer goods industries. Also, factors such as increasing applicability of impact modifiers across varied end-use industries, technological advancements, and the growing demand of impact modifiers in the Asia-Pacific region are driving the growth of the impact modifiers market. ABS (Acrylonitrile Butadiene Styrene) and MBS (Methacrylate-butadiene-styrene) are the oldest impact modifiers used in plastic products. ABS combines the strength and rigidity of styrene polymers and acrylonitrile with the toughness of polybutadiene rubber. The significant properties of ABS impact modifiers are resistance and toughness. When this modifier is added to products, it improves their impact resistance, toughness, and heat resistance properties. PVC is the largest application segment of the impact modifiers market, and is projected to account for the largest share of the global impact modifiers market, in terms of volume, by 2021. This growth is mainly attributed to its easy availability and low cost as well as the increasing applicability of PVC among varied end-use industries, such as packaging, construction, automotive, and consumer goods. The packaging segment is estimated to account for the largest share of the global impact modifiers market in 2016, in terms of volume. The increasing demand of impact modifiers from the pharmaceutical and food packaging sectors is driving the growth of the impact modifiers market in the packaging application. Asia-Pacific is estimated to account for the largest market share of the global impact modifiers market in 2016, followed by North America. Asia-Pacific is also one of the fastest-growing regions in the impact modifiers market. The market in this region is anticipated to grow at the highest CAGR during the forecast period. This growth is mainly attributed to the expansion in the construction sector in countries, such as China and India. The impact modifiers market in Europe registered slow growth in the last five years. This was primarily due to the maturing markets in economies such as Germany, France, Italy, and the U.K., moreover, the financial turmoil in Europe resulted in a decline in demand for packaged food, which affected the growth of impact modifiers market in the packaging industry in the region. The global impact modifiers market is fragmented with several well-established players and few small players. Established players in this market have an edge over small players in terms of product offerings, innovations, and distribution network. Some of the key players operating in the impact modifiers market include E.I. du Pont de Nemours & Co. (U.S.), BASF SE (Germany), The Dow Chemical Company (U.S.), Evonik Industries AG (Germany), and Clariant AG (Switzerland), among others. New product developments & launches, agreements, and expansions were significant growth strategies adopted by leading companies in this market. 12.1 E.I. Du Pont De Nemours & Co.
*Details on Marketsandmarkets View, Introduction, Product & Services, New Developments Might Not Be Captured in Case of Unlisted Companies.